The Dwarf Golden Japanese Barberry is a great plant for zingy foliage color, with its beautiful golden leaves appearing in spring and staying bright and gold until fall. Foliage color is always useful in the garden, since it lasts all season, not just for a few weeks, like flowers, and yellow is an especially useful color, because it goes will many other common foliage colors of other plants. This plant makes an upright, rounded shrub 2 to 3 feet tall and the same across – an ideal size for planting beneath windows around your house, for making a low hedge, or for planting among other small shrubs and flowers in a smaller garden. It can even be grown in a large container or in planter boxes to brighten up your terrace or patio. 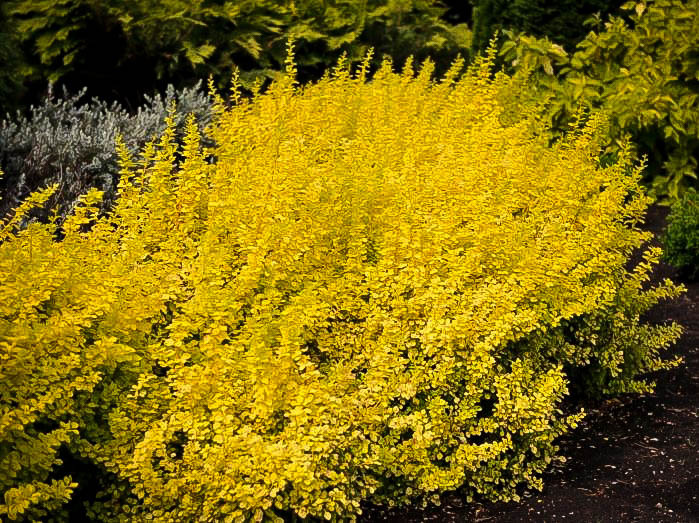 Colorful shrubs for colder areas can be hard to find, but the Dwarf Golden Japanese Barberry is hardy in all but the coldest parts of the country. 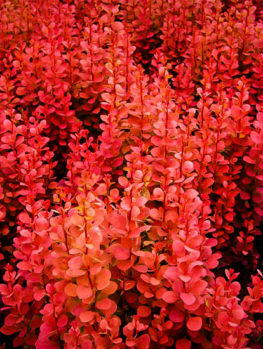 It will grow in full sun or partial shade, thrive in any kind of soil, including poor, sandy soils, and it is drought resistant once established. It can be allowed to grow naturally for low-maintenance, but it is also easily clipped if you want a neater form. It has no significant pests or diseases and it is usually not eaten by deer or rabbits. In many parts of the garden we need tough, reliable, low-maintenance plants that will grow well even in poor conditions. If those plants can also bring color and brightness to our gardens, that makes them even more desirable. 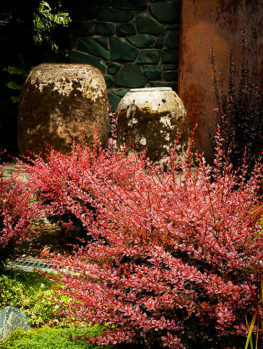 The Dwarf Golden Japanese Barberry is just such a plant – bright, beautiful and easy to grow. In any sunny location, even in poor, dry soil, this little wonder will thrive without any special attention and look great from spring to fall, with its golden-yellow leaves contrasting beautifully with everything around it. This bright gem of a plant will grow almost anywhere. Use it to create a low barrier, or plant it beneath a window without worrying about it growing too tall and blocking the light. Plant it next to dark reddish foliage, or the blue-gray of Juniper Bushes, and have bold color contrasts for months, without relying on the brief existence of most flowers. 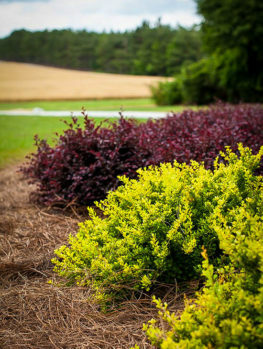 Modern gardeners use a lot of colored foliage to give constant color, and the Dwarf Golden Japanese Barberry is perfect to bring bold golden-yellow tones wherever they are needed. 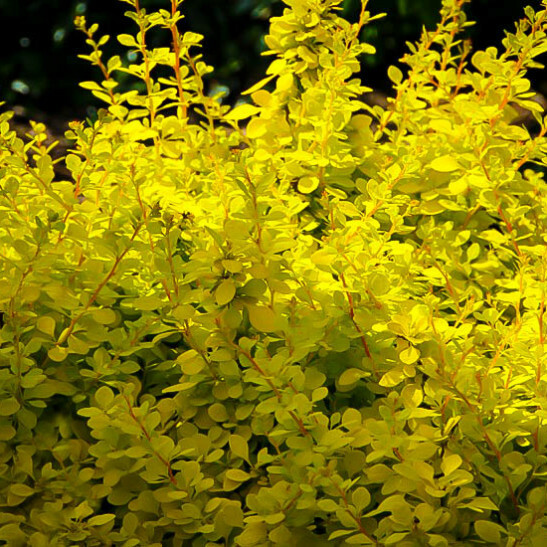 The Dwarf Golden Japanese Barberry is a deciduous shrub that grows to between 2 and 3 feet tall, and 2 to 3 feet wide. 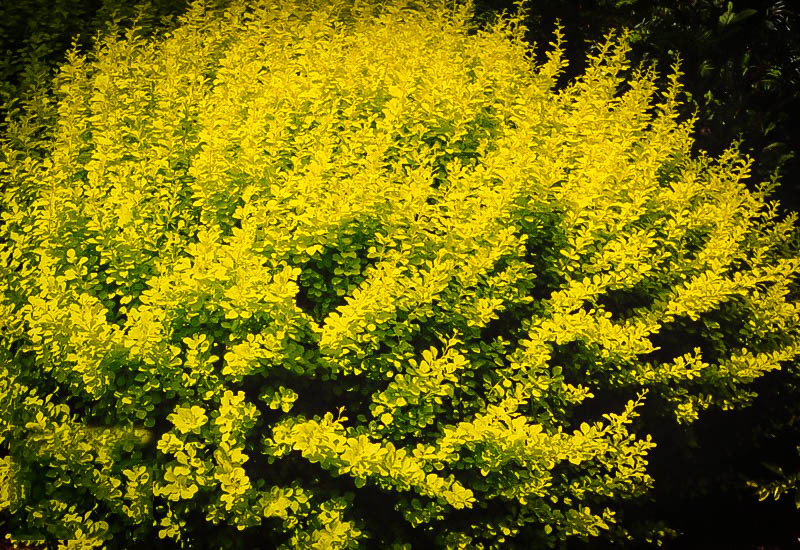 It has small rounded leaves which are golden-yellow in color, bringing a bright splash to the garden. The best color develops if this plant is grown in full sun, and in shadier places the color will be more a fashionable lime-yellow, which is still a very attractive color to have in the garden. The plant itself will grow well in both full sun and partial shade. It makes an upright, twiggy bush, with slightly arching branches. Rather than being in pairs along the stems, the leaves occur as clusters at close intervals along the stem. At the base of each leaf cluster there is a sharp spine, so be a little careful handling this plant. Those spines however do make this plant unattractive to animals like deer, which will usually leave it alone, as also will rabbits. In spring your bush will produce clusters of yellow flowers, hanging down along the stems, and in fall, after the leaves fall, you may see a few attractive red berries. Because of its spines, the Dwarf Golden Japanese Barberry can be useful for blocking spaces where animals such as cats come into your garden, and even to discourage people too. 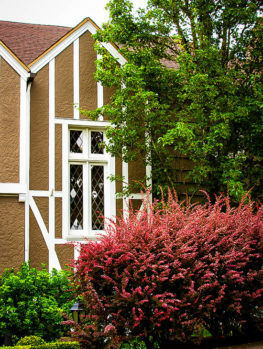 Planted beneath windows it makes them much less attractive to anyone wanting to enter your property, so this plant can protect you as well as bring beauty and color to your garden. As well, avoid planting where you will constantly be walking by and brushing against the bush. You can just allow this plant to grow naturally, as it will always stay neat and compact, but if you want even greater neatness, for a low hedge for example, then it can be clipped at any season and it will grow very densely, giving you the well-groomed look you want. Japanese Barberry (Berberis thunbergii) is native to Japan and China. 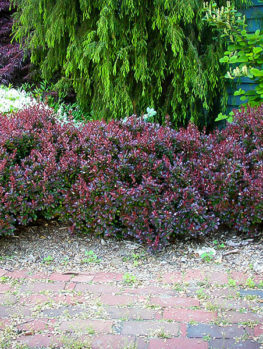 It was introduced into America in 1875 at the Arnold Arboretum in Boston, where it proved popular as a replacement for the European b=Barberry, which in turn had been brought from England for use as a dye plant. It was already known in Japan that this plant could produce forms with different leaf colors, including red, purple, pink and yellow. A form with yellow leaves was found in the USA in the 1950’s and sometime later the Dwarf Golden Japanese Barberry was in turn developed from that plant. Our plants have been produced by taking pieces of those original plants and growing them under controlled conditions. 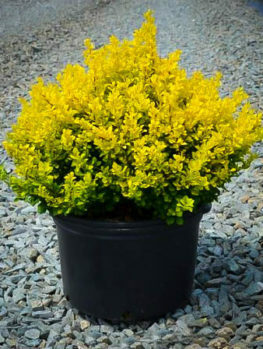 Seedling plants may be cheaper, but they will not have the great color and compact size of this correct form of the Dwarf Golden Japanese Barberry. As well, very few seeds are produced by this variety, and any seedlings usually die, so this variety does not spread into the wild, as some older, seed-grown varieties do. 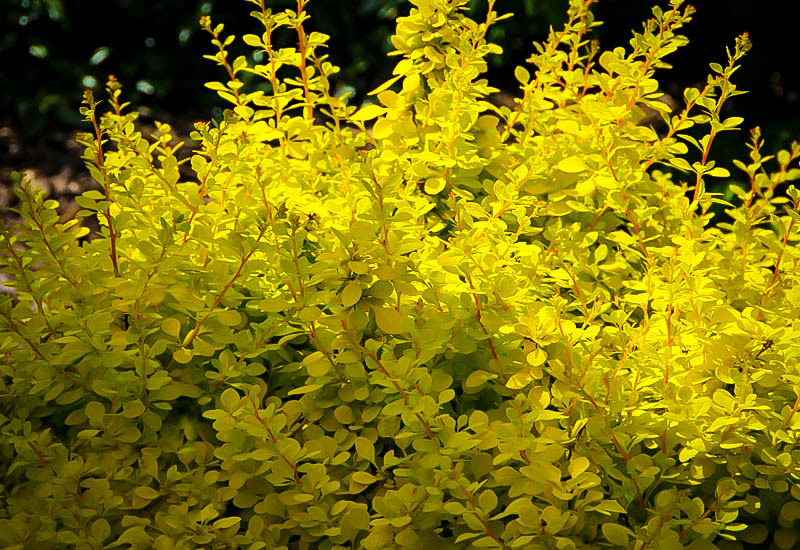 If you are looking for low-maintenance, bright color, hardiness and the ability to grow in almost any kind of soil, the Dwarf Golden Japanese Barberry Bushes are the ideal choice. 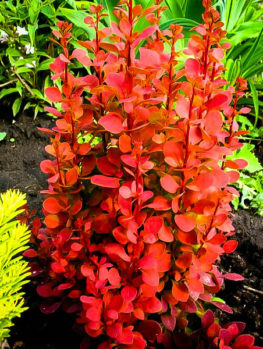 Our supplies of this popular plant may be limited, so order now and enjoy three seasons of color from a tough and reliable plant.